Despite concern that the housing market is slowing, the homebuilder sees plenty of trends working in its favor. This past quarter has been a bit of a mixed bag for homebuilders. While some continue to report fantastic quarterly results, others are starting to show signs that the housing market is slowing down. 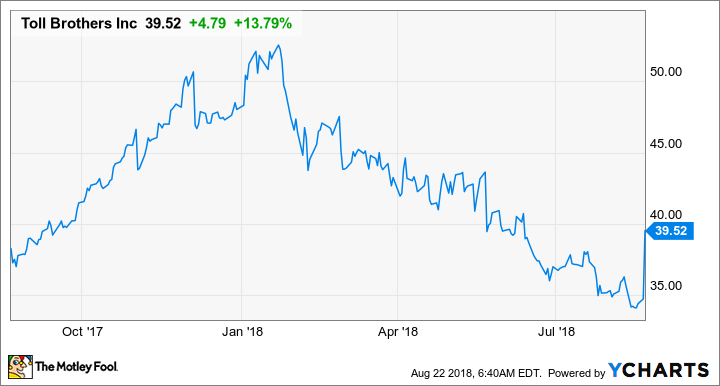 Toll Brothers' (NYSE:TOL) fiscal third-quarter earnings report was decidedly in the former camp as the company posted large year-over-year gains and blew past Wall Street expectations. Here's a brief look at the company's most recent earnings results, and why management seems to think that the good times will continue even though some peers are showing fatigue after several years of an expanding housing market. Data source: Toll Brothers earnings release. EPS = earnings per share. Toll Brothers' prior earnings were already showing solid growth, as management was able to post impressive unit sales in what is typically a slower time of the year. The one concern from the prior quarter was that gross margins had slipped considerably, raising concerns about higher material and labor costs. Management said that it was temporary, though, as it was widening its footprint with new communities and an expanded building capacity. It appears that the spending ramp was indeed the case as gross margins ticked back up to 21.1% this past quarter to go with its 27% increase in revenue. That revenue increase came from the one-two punch of higher unit sales (up 18% to 2,246) and higher average selling prices (up 7.6% to $851,900). Across all of its regions, there was some combination of higher home prices and considerable increases in unit sales to produce higher revenue. Data source: Toll Brothers earnings release. Even though management is investing heavily in new developments, it has still found enough cash to buy back a considerable amount of stock. In the quarter, it repurchased $136 million in shares, which makes a total of about $438 million in share repurchases in this fiscal year. Considering how much shares are down so far this year and that its stock trades for a very reasonable price-to-earnings ratio of 11, this seems like a pretty good time to be buying back large chunks of stock. We believe there is room for continued growth in the new home market in the coming years. Household formations have been increasing, and in many regions the aging housing stock may not satisfy the lifestyles of today's buyers. Yet new home production has not kept pace with the growth in population and households. On the single-family side, housing starts, other than during the anemic years of this recovery, are at their lowest level since 1970. In addition, existing-home values have increased, providing potential move-up and empty-nester customers with more equity that they can put toward a new home purchase. We believe these two groups, along with the growing number of millennials starting to buy homes, are all sources of potential new demand in the coming years. The housing market is providing ample opportunities for homebuilders to grow revenue and earnings. Even weaker-performing companies have posted considerable gains over the past few years. What matters for investors, though, is finding homebuilder stocks that are going to stand the test of time. Toll Brothers has carved out a niche in this industry by catering to the luxury market, and is even experimenting with new opportunities such as luxury apartment sales and rentals in denser urban areas. This high-end market also means Toll Brothers can obtain decent margins despite the much higher costs for materials and customization. Management seems to think that, despite the recent slowdown, there is still plenty of room for the business to grow. The broader demographic trends of pent-up demand and lots of move-up opportunities should give Toll plenty of runway for growing the business, and its luxury home offerings aren't as likely to be affected by more price-conscious buyers. Even after the recent stock surge following earnings, Toll's stock is still down considerably from its highs at the beginning of the year and looks like one of the more attractive stocks in this industry.